Located 1 mile east of Ruddington. More commonly known today as Flawford, the name Flawforth was also used historically. Thoroton (1) writing in 1677 refers to the settlement as Flawforth, whilst Throsby (2), updating and extending his work records it as Flawford. A Lost Village or just a Lost Church? Any status as a 'Lost Village' is largely as a result of the documented removal of its church in the 18th century (see below), and the suggestion that, around the church, the site once also possessed a number of houses. "Nothing remains of the village", he says, "which occupied the top of a slight hill. That the place was of some importance is witnessed by the fact that the church was the mother church of the chapelries of Ruddington and Edwalton". Throsby (3) too makes reference to there having once been a village on the site: he says that leave was given to demolish the Flawford/Flawforth church in 1773 because it was in a very ruinous state and because "not a dwelling of the village remain[ed]" (our italics). Again, a newspaper report (quoted by Throsby (2)) - from "the Nottingham paper" - at the time of the church's demolition refers to "the cottagers of the village have amused themselves, to the number of 30 or 40 at a time, with drawing wagons loaded with stone, containing near three tons, from the spot where the fabric stood, to a brook near two miles distant.... for the purpose of building a bridge...." (italics added). The original church was Saxon, being largely replaced by a medieval structure in the 13th and 14th centuries. The position of the church meant that it was on a crossroads and virtually equidistant from the villages of Ruddington, Plumtree, Edwalton and Bradmore. The fact that Flawford church was built in this location suggests that it was the earliest of the local churches, pre-dating those later established in the four surrounding villages. (There is only documentary evidence, however, to show that it served as the mother church for Ruddington and Edwalton. Writing of the church at Flawford/Flawforth, Guilford (3) says "Various descriptions of the building remain, which show it to have been of considerable size. It was not used after 1718, and was pulled down in 1773". 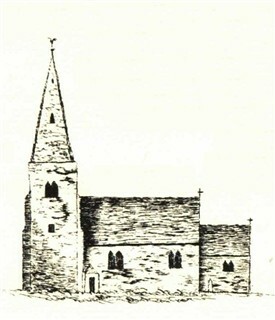 In fact parts of the church were demolished separately at different times - the nave in 1773 and the chancel in 1778 - with the graveyard continuing in commission till at least 1787. Interestingly, the date of 1773 for the demolition of the churchis nicely recorded by Throsby (2) where he says "In an old memorandum book, shewn me by the clerk of Ruddington, which was kept by an old schoolmaster, is the entry 'Saturday June 12th, 1773, Flawford Church was demolished by colliers"
Today, the site of the church is preserved as open ground with the outline of the church depicted in stones. This page was added by Website Administrator on 22/04/2015. Wow, never realised Flawforth was a village. My aunt and uncle lived on Flawforth Avenue when I was a child and my cousin still lives there. Great information, thank you. Very interesting account, the roads between the villages are still there but now essentially farm tracks. Saw the remainjng headstones and had to check why they were there. Thanks to those who researched this.